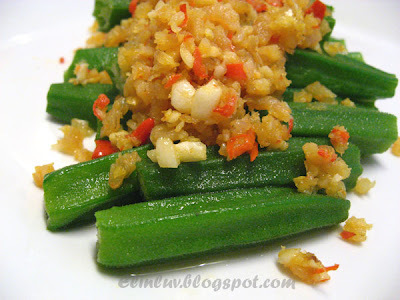 You can either cook them in curry or blanch it and serve it with sambal or my grandma style...mix the pounded raw dried shrimps with chopped chillies, fresh garlic and calamasi juice and a pinch of salt to taste...you will simply love this tangy and hot dried shrimps garnishing ....one word it is delicious ! No oil and it is so healthy. Mix together ingredients A in a bowl and leave aside. 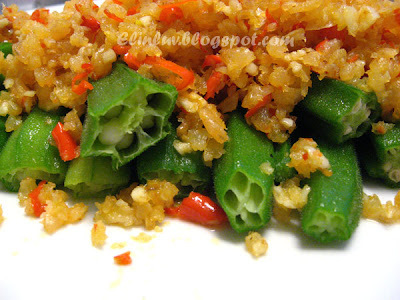 Blanched okra in hot boiling water , with 1 tbsp olive oil added , till it is just cooked. Take out and drain off excess water . 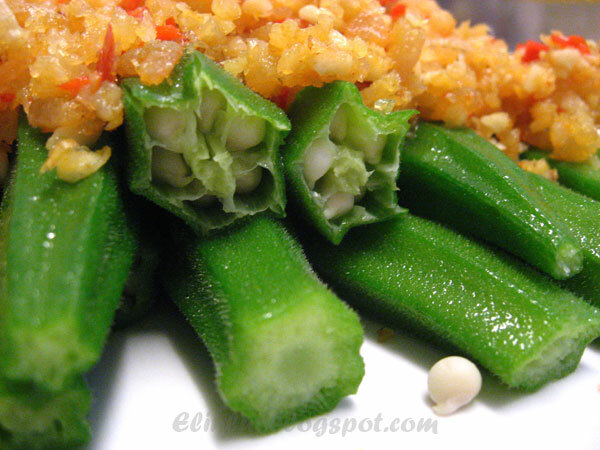 Cut off the head and end part of the okra and arrange neatly in a row on a serving plate. 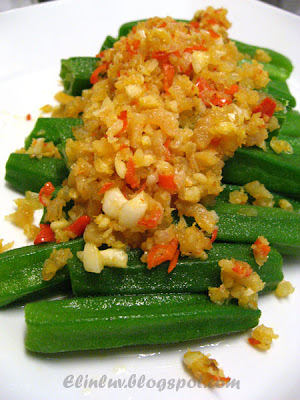 Garnish with the the dried shrimps mixture and this dish can be served as appetizer or a main dish with hot steaming rice. Your grandma is a good cook . It shows in YOu Elin! That really is simple and DELICIOUS!!!!! Oh? The dog bun? The one you gave your very good friend? Humph! I'm definitely not going over to that other blog to see.... See only, what for? Hehehehehe!!!! Merajuk dah! I love okra...in any form of cooking! This is definitely a easy and delicious way to prepare it, I'm already drooling think how yummy this it! Lol! I made something almost similiar in presentation few days back, hehehe. My hubby hates this, but luckily my MIL loves this, so when she's back, I take the opportunity to cook this. I'll try your topping next time. 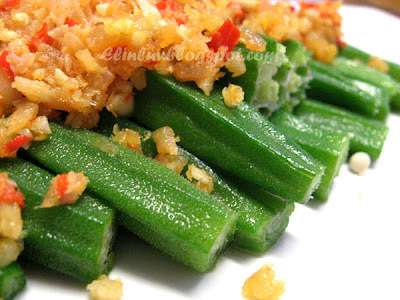 I am totally enticed with this great looking okra dish! Authentic dishes!! i remember my grandma's best dish is the ginger stewed duck! 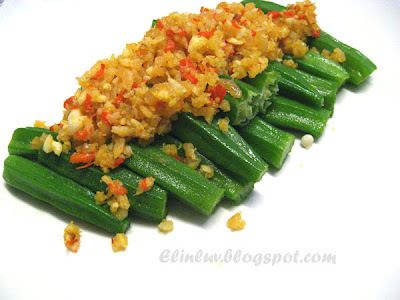 i miss that dish very much now come to think of it.. I also heard pregnant ladies are encouraged to take okras for easier delivery due to the mucilage..it will 'smoothen' your delivery 'process'! delicious toppings! Zurin...hahaha you make me happy :) yea...it is simple and delish !